PeopleSoft Grids are most common form of data display control and they display fields in spreadsheet like format. 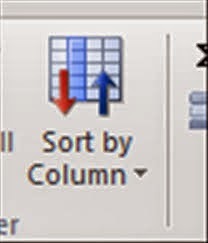 Often, we need to provide custom sort for grid columns in various situations. This can be achieved easily by using Sort Method in Rowset PeopleCode class. However, there are few things to consider and we will look at it later in this post. First, how do we provide custom Sort in a grid. Note that MY_GRID_REC.COL1, MY_GRID_REC.COL2, MY_GRID_REC.COL3 are your grid columns that you want to sort and MY_GRID_REC is the primary record of the grid. "A" specifies ascending order; "D" specifies descending order. You can get back the custom sort you provided, by executing the same PeopleCode. To do that have to place a button on the page and allow user to click it to get back the custom sort on the grid.